First, the default is not Arial. The default is Droid Sans. Second, to change to a different built-in font, use android:typeface in layout XML or setTypeface() in Java. Third, there is no Helvetica font in Android. The built-in choices are Droid Sans (sans), Droid Sans Mono (monospace), and Droid Serif (serif). While you can bundle your own fonts with your application and use them via setTypeface(), bear in mind that font files are big and, in some cases, require licensing agreements (e.g., Helvetica, a Linotype font). The Android design language relies on traditional typographic tools such as scale, space, rhythm, and alignment with an underlying grid. Successful deployment of these tools is essential to help users quickly understand a screen of information. To support such use of typography, Ice Cream Sandwich introduced a new type family named Roboto, created specifically for the requirements of UI and high-resolution screens. The current TextView framework offers Roboto in thin, light, regular and bold weights, along with an italic style for each weight. The framework also offers the Roboto Condensed variant in regular and bold weights, along with an italic style for each weight. You might want to create static class which will contain all the fonts. That way, you won't create the font multiple times which might impact badly on performance. Just make sure that you create a sub-folder called "fonts" under "assets" folder. * Returns a loaded custom font based on it's identifier. * @return Typeface object of the requested font. This way, you can get the font from everywhere in your application. The answers above are correct. 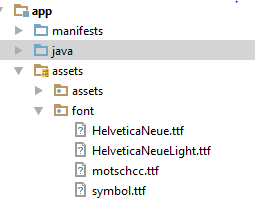 Just make sure that you create a sub-folder called "fonts" under "assets" folder if you are using that piece of code. Mind you, this double-checked locking idiom with the volatile field only works correctly with the memory model used in Java 1.5+. Best practice is to use Android Support Library version 26.0.0 or above. Enclose each font file, style, and weight attribute in the element. It's a little old, but I improved the class CustomFontLoader a little bit and I wanted to share it so it can be helpfull. Just create a new class with this code. I finally got a very easy solution to this. This way, you can create a View which inherits from TextView and calls setTypeface on its constructor. add to attrs.xml , The numbers should be in the order in array class. Android uses the Roboto font, which is a really nice looking font, with several different weights (regular, light, thin, condensed) that look great on high density screens. Not the answer you're looking for? Browse other questions tagged android fonts textview or ask your own question. 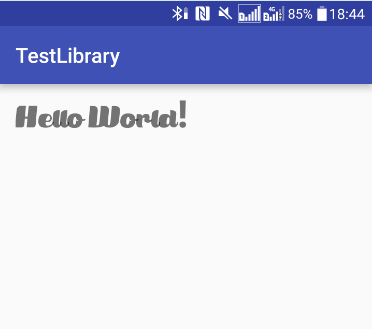 How to set Font for TextView in android?